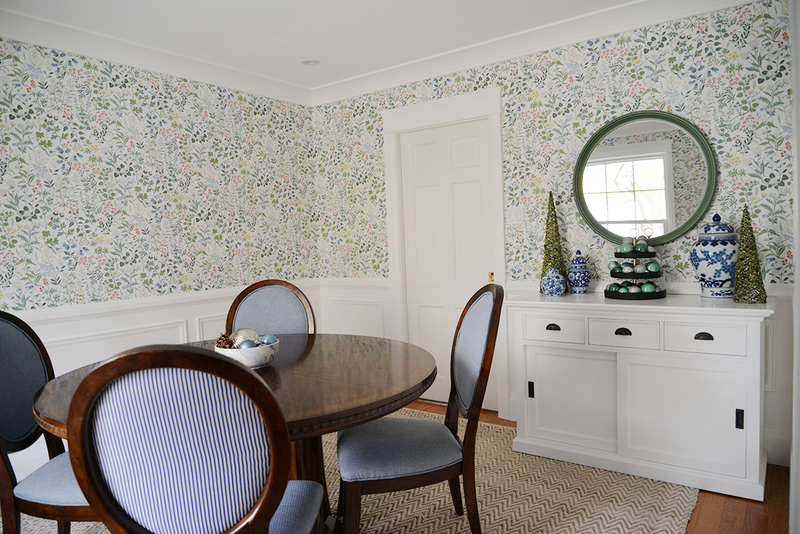 I think our dining room makeover might be our slowest makeover ever. I feel our lack of progress is because there's not many furnishings required in this room, and so I'm being more deliberate about my choices. I'm still deciding on a rug (hopefully, I'll pick one up during the Black Friday sales) and I have my eye on a light fixture (but it won't be in stock for a few more weeks). However, one critical piece of furniture that we needed has arrived just in time for the holidays. 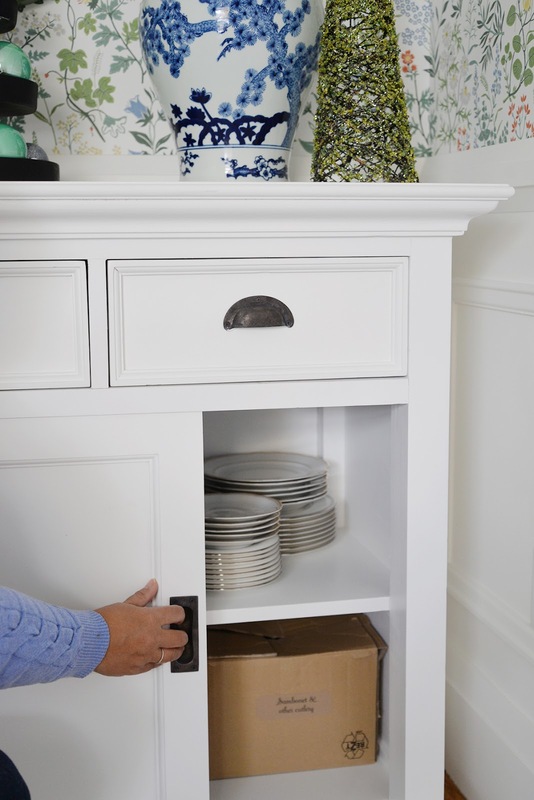 We’ve added a dining room storage cabinet and I'm excited to show it to you! Do you believe in serendipity? I've had this server saved in my files for months. Shortly after we installed the dining room wallpaper, I was contacted by NovaSolo, who, it turns out, is the manufacturer of the server I had my eye on. They're a new-to-me brand, but I have quickly fallen in love with their products. 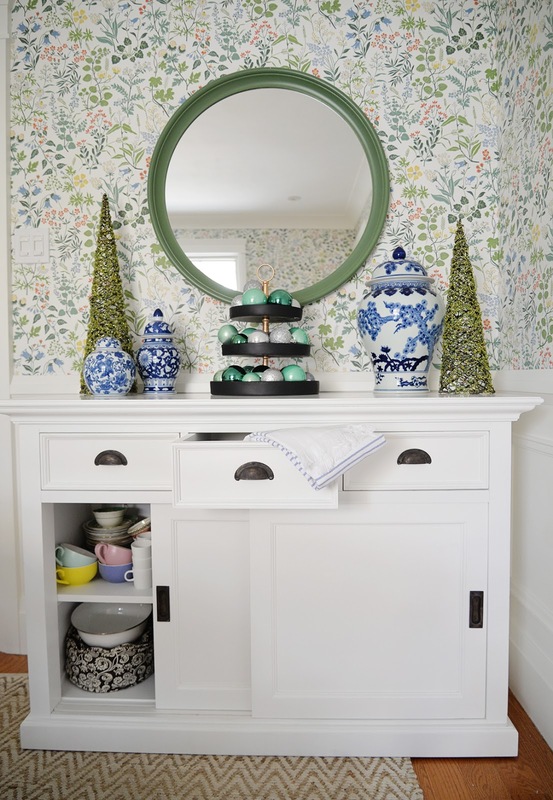 If you're a fan of transitional style furnishings, you'll want to take a look at their collection of white-painted bookcases, desks, rattan chairs, and so much more. You can purchase their products through sites like Wayfair and Hygge Home. and it had to be well constructed. I've had way too many cheap assemble-yourself buffets eventually buckle under the weight of the dishes and serving pieces stored inside. It was time to get a grown-up sideboard! The Halifax buffet was everything I was looking for. Crafted of solid mahogany and composite wood and painted in a beautiful white finish, the server is a classic piece. 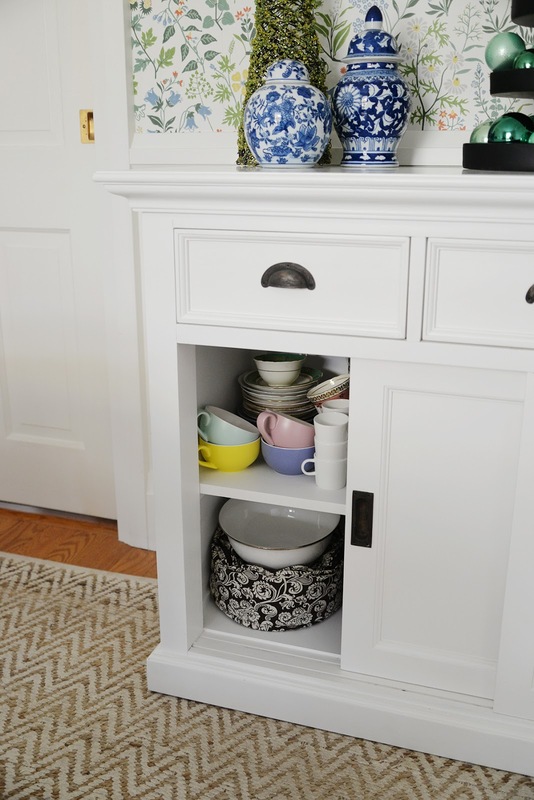 It's offered in different variations and sizes, with closed and open storage, swinging doors or sliding doors, but this configuration had just the right proportions for my small dining room. The buffet arrived fully assembled and it is very solid but at 150 lbs, be warned, you'll need two people to move it! 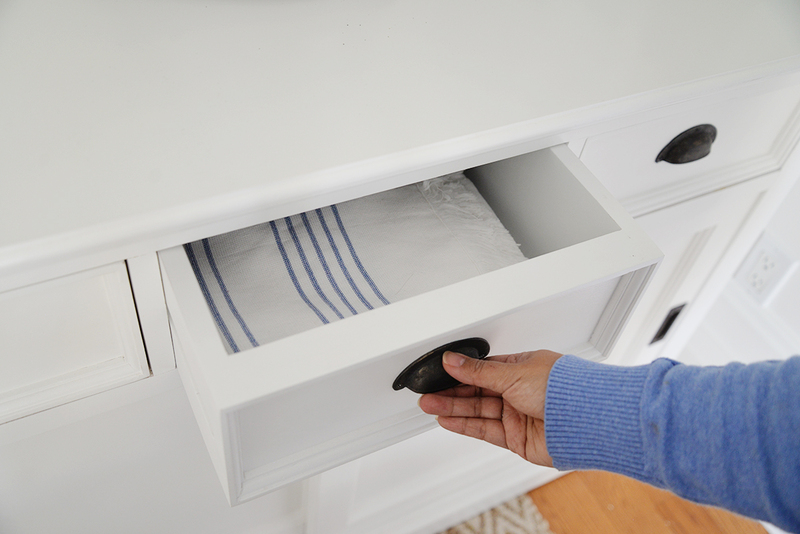 The two sliding doors and three drawers operate smoothly and there's lots of room for storage. I love the simple design and fully painted interior. I'm using the server to store our wedding dishes and my teacup collection so I was glad to see how nice and thick the built-in shelves were. We've had our formal dishes sitting in boxes since we moved almost two years ago so it felt good to finally put them away. Doesn't this server look like it was made for this room? It fits perfectly beneath our chair rail and the styling of the piece mimics the moulding on the walls. 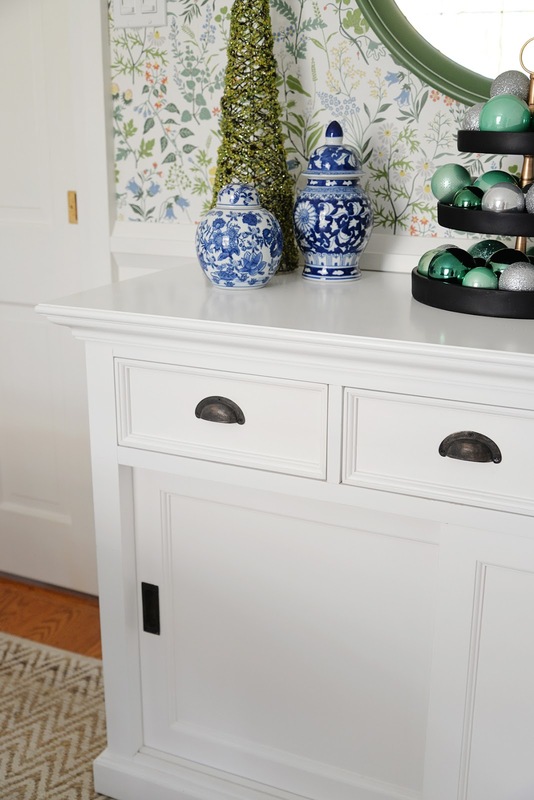 Details like the crown moulding on the server and the classic black cup pulls make the server look and feel expensive. I've styled the top of the server very simply for the holidays. 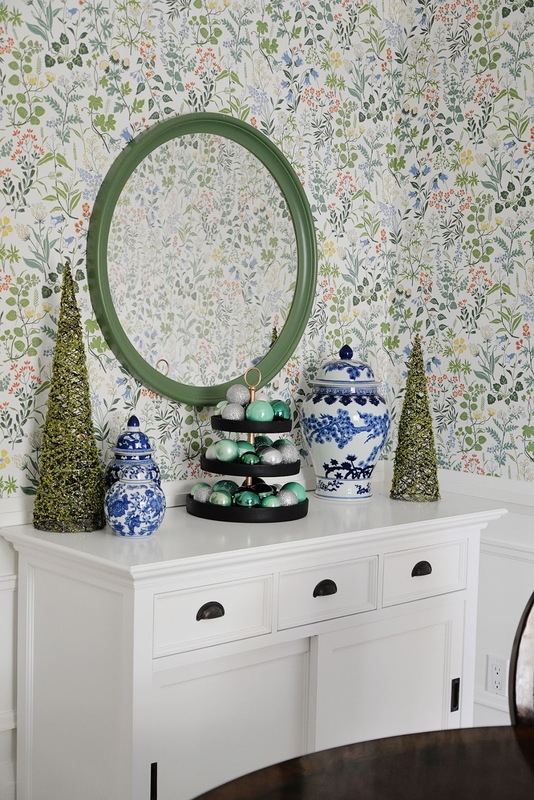 My blue ginger jars paired with green trees and a tiered tray of aqua ornaments feels fresh and festive. 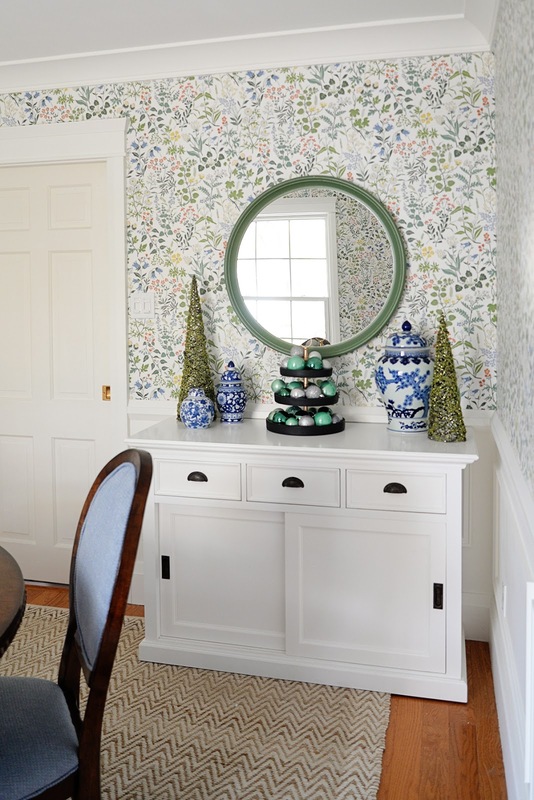 The round Ikea mirror is one we've had sitting in storage for over a year and it works perfectly in this room. 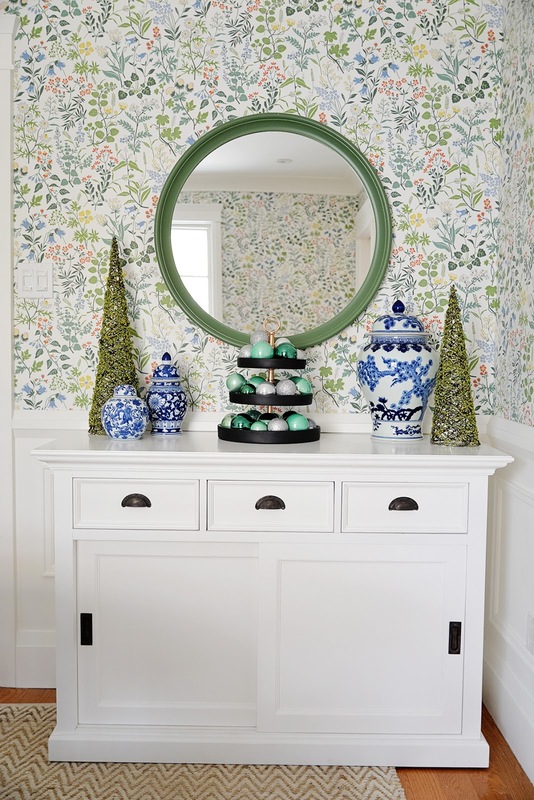 I love how it picks up the green tones in the wallpaper. 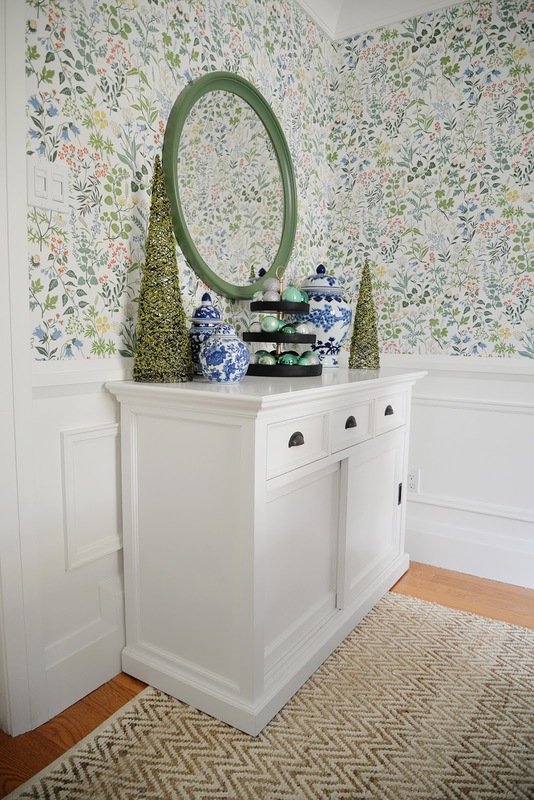 The white finish is versatile and It'll be fun to change the look and style this area for the seasons. The dining room is still a little bare (yes, I haven't a ordered window covering yet!) but I'm thrilled with how this little corner has turned out. I instantly feel more organized and ready to entertain guests in the dining room. Bring on the holiday parties! Disclosure: This conversation is sponsored by Nova Solo. Thank you for supporting the quality brands who make this blog possible and whose products I bring into my own home.